Gridded bathymetry at 40m resolution surrounding Howland Island, within the Pacific Remote Island Areas - Central Pacific Ocean. Bottom coverage was achieved in depths between 8 and 3800 meters. The Arc ASCII grids and floating point geotifs include multibeam bathymetry data acquired over multiple surveys by the NOAA Ecosystem Sciences Division (as of April 2015). The data were acquired using the Simrad EM300, EM3002D, and Reson 8101 multibeam sonars, with sonar frequencies of 30, 300, and 240 kHz respectively. Access Constraints: none | Use Constraints: These data are not to be used for navigation purposes. Please cite NOAA Ecosystem Sciences Division (ESD) when using the data. Suggested citation: Ecosystem Sciences Division; Pacific Islands Fisheries Science Center (2017). 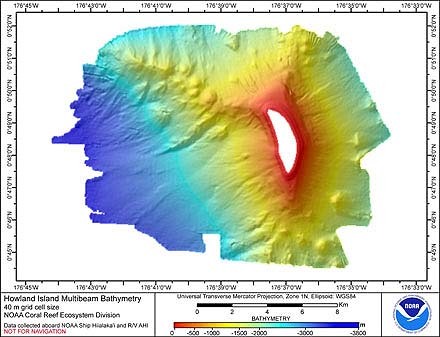 Gridded multibeam bathymetry of Howland Island, Pacific Remote Island Areas, Central Pacific. https://inport.nmfs.noaa.gov/inport/item/47761 | Distribution Liability: TWhile every effort has been made to ensure that these data are accurate and reliable within the limits of the current state of the art, NOAA cannot assume liability for any damages caused by errors or omissions in the data, nor as a result of the failure of the data to function on a particular system. NOAA makes no warranty, expressed or implied, nor does the fact of distribution constitute such a warranty.